... just the word brings pleasure to most people! Whether it be rich, chocolate truffles, chewy caramels, or pecan paws just waiting to be tasted... people, no matter where you travel, are lined up in chocolate shops all over the world to indulge their passion. ... whether it be in the form of candy bars, hot cocoa, chocolate sculptures, chocolate clothes (yes, they were displayed at the Chocolate Show in NYC!) 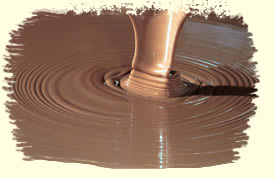 chocolate fondue, or the latest... a chocolate spa, people find different ways to indulge in their passion. New England Chocolate Company is proud to create, handcraft, and market the highest quality Belgian chocolate products at its retail location where the customer can see and learn how the delicious confections are made. New England Chocolate Company is dedicated to providing the finest chocolates using the freshest ingredients and not adding preservatives. We know you will agree! With the completion of our combination retail/manufacturing facility, we are now able to offer our full line of chocolates - including creams, caramels, truffles, and many more exquisite selections. You may visit our retail store Thursday through Monday, 11 AM to 5 PM, Eastern Time. Our address is 123 Lafayette Road, Salisbury, Massachusetts 01952. Call our information line at 978.465.9295 for further help or click here for a map showing our location. Thank you for visiting NewEnglandChocolateCompany.com - Come back again soon. © Copyright 2017 New England Chocolate Company All Rights Reserved.